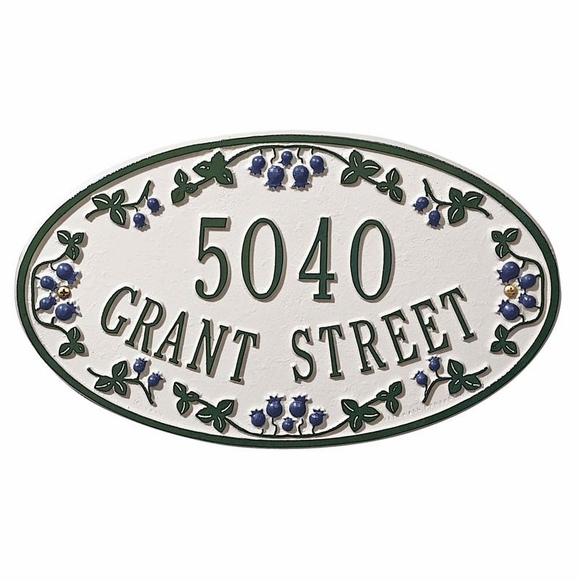 Catalina Personalized Oval Address Plaque with Berries - - one line or two line 13.25" x 8" oval sign with your choice of blueberry, raspberry, or strawberry design. Made in USA. Vibrant and crisp three-color address signs. Blueberry sign features green for the address and border with green leaves and blue berries. Raspberry features red for the address and border with green leaves and red berries. Strawberry sign features red for the address and border with green leaves, tiny white flowers, and red berries. One or two line 13.25" x 8" oval sign with your choice of blueberry, raspberry, or strawberry design.